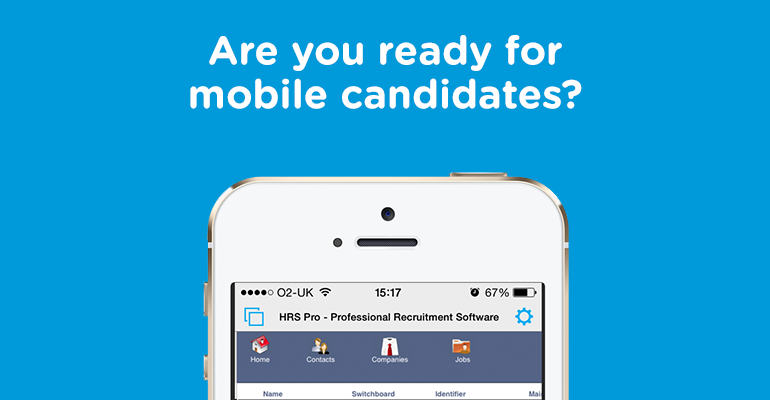 Are you ready for mobile candidates? +44 (0) 203 4755 775 hello@gethrs.com Support Search Login Viewing: Home : Are you ready for mobile candidates? The mobile movement continues to grow at a rapid pace, with candidates searching, communicating and applying for roles via a smart device it is important that your system allows consultants to respond in a timely manner. The increase in mobile usage has not only changed the way we search and use the web, it has also significantly reduced the window in which we expect a response. With major peaks in candidate searches via mobile happening before work, during lunch and after work; timely responses are more important than ever. Chances are you have invested in a mobile optimised website and appropriately branded social media channels, but have you considered the impact your recruitment CRM has on the candidate journey? Allowing consultants to update records, match new candidates with available roles and search your entire database at a client site or outside of traditional business hours could be difference between missing out and closing a deal. HRS allows your database to be truly mobile, at no extra cost. Users can log into their entire data, not a scaled down version, but the real thing on their smart device from anywhere in the world with an internet or 3G/4G connection. Whether your office is Apple or Windows based (or a mix), HRS provides users with the full range of features. With built in user levels HRS also helps ensure your data is kept safe. You can set up your system to allow full access to relevant employees and limit access to staff that don’t need it. For more information on HRS mobile solutions head over to our dedicated mobile recruitment software page or request a call back from one of our specialists.